Since I currently live in the desert and have a ton of awesome hiking spots nearby, staying hydrated on the trail is super important to me. If you’ve ever hiked in the dry desert climate, then you know why I’m so vigilant about making sure I drink enough water out there. And since it’s rather warm here in Southern Nevada, I prefer to have my water cold when I’m drinking it instead of warm or lukewarm. 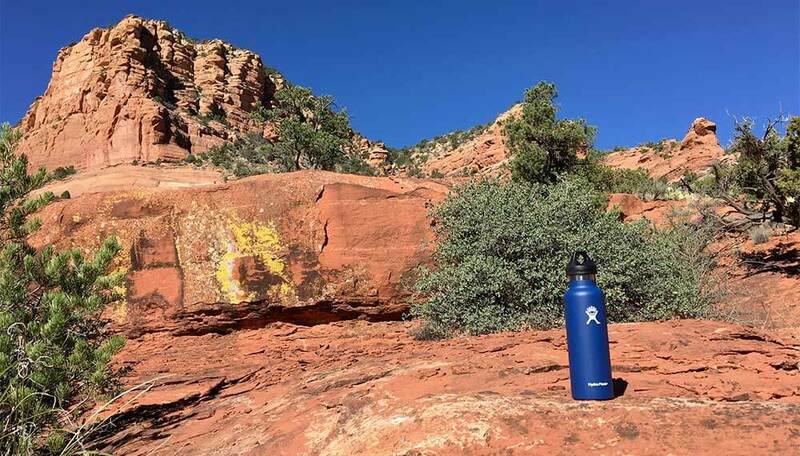 So, for me the ideal water bottle is stainless steel, not too heavy, easy to carry in my pack, durable, doesn’t spill, and keeps my water cold no matter how long I’m in the desert sun. Conclusion: Which One Is The Best For Hikers? I admit that there was nothing scientific about my testing of stainless steel water bottles. I simply filled some bottles with cold water from my Brita pitcher at home, drove to the hiking trail, put the bottles on the sides of my pack, and set out hiking. And when I got thirsty, I sampled the water from each to see how good they were at keeping the water cold. Of course, the real test was how cold these bottles were at the of my hiking adventure. Just keep in mind that it’s possible different amounts were removed from each bottle when I took my on-trail sips, which could have affected the end result temperature. I repeated by unscientific testing and got the same results, so even though this wasn’t a super controlled experiment, I do feel pretty confident about the results. I know, the Starbucks one is a bit of a wildcard, eh? Well, here’s the story on it – I keep this tumbler on my desk for my daily water and it keeps it super cold, so I thought, what the hell – why not test it too?! As you can see, these bottles are all pretty much the same design, with the exception of the Starbucks tumbler. You might be surprised to see how they held up against each other though. As I mentioned earlier, I have a few criteria that are important to me when it comes to choosing a water bottle to take with me on my hikes. In addition to being stainless steel, those criteria are: not too heavy, easy to carry in my pack, durable, doesn’t spill, and keeps my water cold no matter how long I’m in the desert sun. With that in mind, I’ll be reviewing the four models I’ve tested based on my criteria and nothing else. I really like how comfortably this one fits in my hand, and it also fits in the cup holder of my car – bonus! Since I’ve had this bottle for a couple of years, the lid that I have on mine doesn’t seem to be on offer any longer. But, it’s similar to the lid in the image below. I used the 24 oz bottle for my testing. 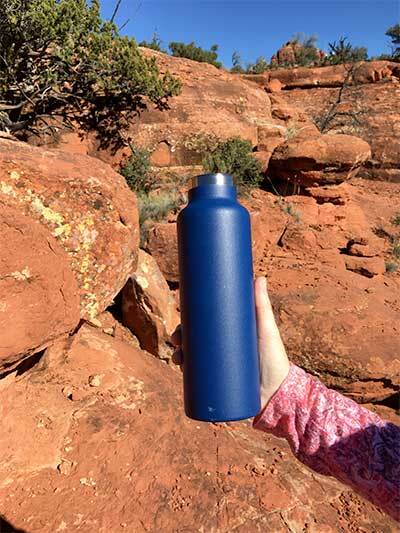 I can be a bit of a klutz, both on the trail and off, so it should come as no surprise to anyone who knows me that while I was hiking in Sedona a couple of months ago, I actually dropped my Hydro Flask and it bounced down the trail. How did I drop it? It was in the side pocket of my Osprey daypack and I leaned over to tie my shoe and it just slipped right out of that pocket! Despite rolling down a mountain side, the only damage was the small ding that you see in the photo below (on the lower portion of it). I’ll be honest here, I wasn’t sure what to expect from this one since YETI is such a trendy brand right now. I wondered if it would be the best of the bunch or just overpriced. I tested the 26 oz. version of this bottle. This one was not quite as easy of a fit in the pack side pockets and it didn’t fit in my car’s cup holders at all, except for the larger ones on the door. I also want to point out that it was larger than the Hydro Flask, which probably affected it’s cooling ability in comparison. Easy to clip on pack with carabiner? Yes, but freedom of movement not as good. Overall, I wasn’t so impressed with this one that I’d choose it over the lower priced Hydro Flask. It seemed like this one wasn’t quite as cold, but the capacity was larger and that probably affected it. I came across this bottle at my local REI, read some reviews online and decided to give it a try. It was the cheapest of all the options that I tested and I was somewhat familiar with the brand, so I thought it would be a good choice. I tested the 27 oz. model of this one. Though this one has a slightly higher capacity than the YETI model above, I felt it was a more comfortable fit in my hand than the YETI. It also fit in my car’s cup holder and my pack’s side pockets. Easy to clip on pack with carabiner? Yes. Yes, I know, this isn’t really your standard outdoorsy water bottle choice right here. In fact, I may be the only person to hike with one of these in my Osprey side pocket. But alas, I did it and you might be surprised to hear about it. The capacity for this tumbler is 16 oz. 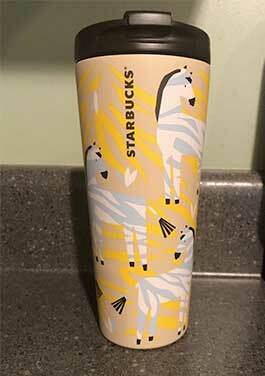 I don’t know who makes these tumblers for Starbucks, but I’m not gonna lie – this one kept my water the coldest. Of course, it does have the smallest capacity, which probably has a lot to do with that. Easy to clip on pack with carabiner? No. Keeps cold? Yes, the coldest! Let me warn you though, this awesome zebra design is no longer being made, so you’ll have to settle for something else. Okay, so there was no single stand out option amongst the models that I tested, so let’s just look at the winner for each of my criteria. 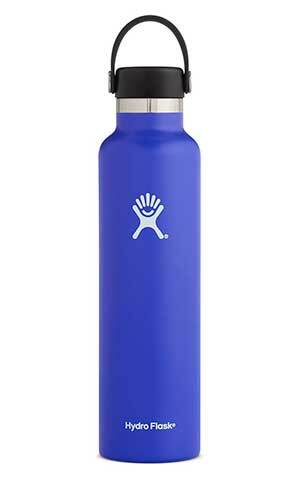 So, in my opinion I think that the best stainless steel water bottle for hikers right now is one of the models from Hydro Flask. However, I do want to note that Klean Kanteen is supposed to make a more insulated model (that I didn’t test) and it’s possible that it might edge out Hydro Flask. If you’ve used both, I’d love to know what you think!